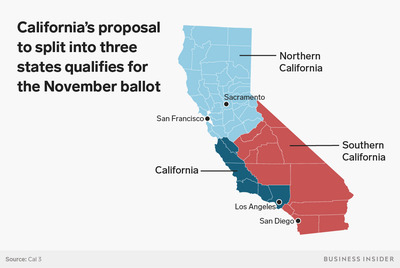 A proposal to split California into three states – Northern California, California, and Southern California – has qualified to appear on the ballot in November’s general election. The Cal 3 ballot measure received more than 400,000 valid signatures, thanks to financial backing from Silicon Valley investor Tim Draper. It’s still unclear if cutting up California into three states is legal and if Cal 3 could muster enough support from California voters and US Congress. We spoke with some experts about how Cal 3 could work. 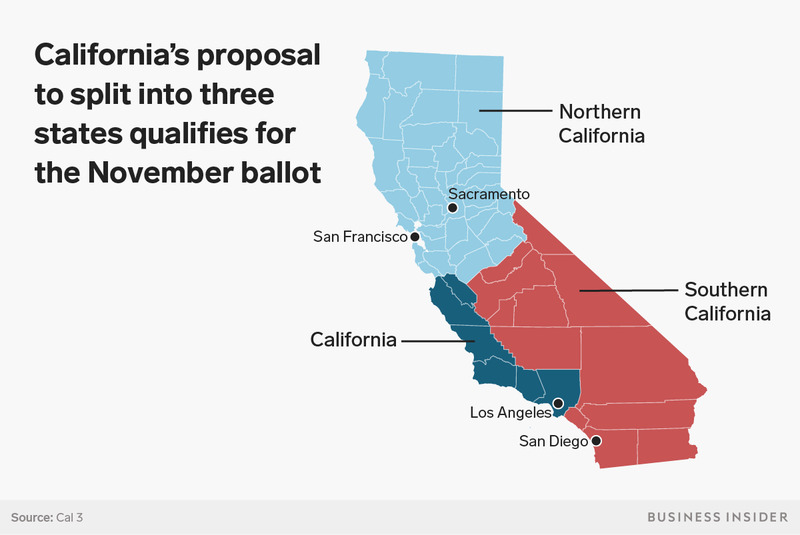 A proposal to divide California into three states – Northern California, California, and Southern California – qualified last week to appear on the ballot in November’s general election. It received over 458,000 valid signatures, more than the number required by state law to get on the ballot, thanks to an ambitious campaign called Cal 3 and financial backing from Silicon Valley tycoon Tim Draper, an early investor in Tesla and Skype. There’s bad news for anyone in support of this initiative: Even if the measure gathers enough support at the polls, it would still be incredibly difficult for California to pull off. All states have a special process for amending their state constitution. In some states, two houses of congress need to approve a ballot measure before residents get a chance to weigh in at the polls. California is an oddball. The state’s initiative process lets a vote by the people pass a measure into law, without the blessing of the state legislatures. The ballot measure put forth by Draper, a well-known tech investor, establishes new boundaries for three new states within the existing California and provides the “legislative consent” of the people of California. With a few choice words, the initiative argues that it doesn’t need state congressional approval before moving onto US Congress. But there’s a catch. The California Constitution says through the initiative you can change the constitution only so much. A small change to part of a constitution is called an amendment, while a holistic and fundamental change to a constitution is considered a revision. State law requires more than a vote by the people to enact a revision. The proposal to slice and dice California into three states bills itself as an amendment. Shaun Bowler, a political science professor at UC Riverside who’s studied California’s initiative process, says that’s wishful thinking. Draper, who’s tried twice before to break up his home state, has given $US1.2 million to Citizens for Cal 3, the campaign supporting his quest. And the process of gathering signatures could easily have cost Draper an additional $US1 million, according to experts on California’s initiative process that Business Insider spoke to. Cal 3 racked up nearly half a million signatures in California cities from San Francisco to Fresno to Yuba, with a majority of signees in Los Angeles. Still, the numbers don’t look good for Draper. An early poll from Survey USA found 17% of California voters would vote to divide, but the survey only sampled about 900 people. 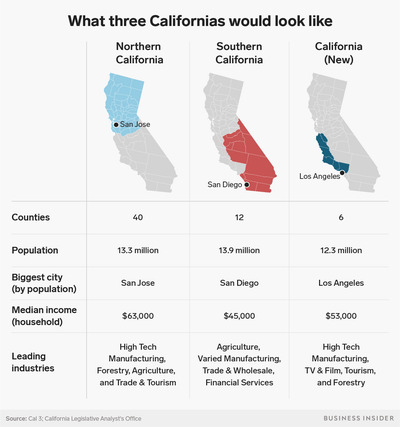 Let’s suppose that in an unexpected twist, a majority of California’s 39 million residents decide to break up the most populous US state and the world’s fifth largest economy (bigger than the UK). Opponents might challenge the measure as unconstitutional, on the grounds that it counts as a constitutional revision and not an amendment. The debate eventually moves onto the California Supreme Court, and the measure could die there. Now imagine that Cal 3 makes its way to Washington, in spite of all obstacles. Article IV, Section 3 of the US Constitution says that no new state can be formed out of existing states without the consent of the other states. It means that the US House and US Senate both need to sign off on California splintering into three states. Under the proposal, each state would have two US senators and a number of congressional representatives based roughly on its population. As a result, the people of today’s California would gain several more voices in the Electoral College, who cast votes for the election of the president and vice president. Vikram Amar, a professor and dean of the College of Law at the University of Illinois, says the question of whether or not to partition California gets political here. “California can be relied upon to deliver all 55 electoral votes to the Democratic Party. It’s a very solid, predictable blue state,” Amar told Business Insider. But the potential state of Southern California, which contains much of the urban sprawl and desert communities of the Inland Empire, could be considered a swing state, according to Amar. Had it been its own state during the 2012 presidential election, Southern California would have gone for Mitt Romney. Five out of 12 counties voted for Donald Trump in the 2016 election (not a commanding lead). Politicians may think twice about carving up a state that has long voted Democrat. “The Dems are never going to risk that,” Amar said. On the flipside, the Republican Party may also be wary of three Californias. The proposal would give the people of California six US senators instead of two. Amar, who’s followed Draper’s efforts to cut up California since 2014, doesn’t like to conjecture about the likelihood of the tech investor’s proposal coming to pass. Still, he doesn’t give Cal 3 great odds. “I would say it doesn’t seem like it has the backing it would need from a wide array of political forces, but it does have the backing of some wealthy individuals, like Mr. Draper,” Amar said.